Published March 23rd, 2009	in Money Saving Tools. 0 Comments	Tags: Google, TipJar. Use money-back credit cards instead of any credit card and pay in full every month - you will be surprised how much money you can claim back! 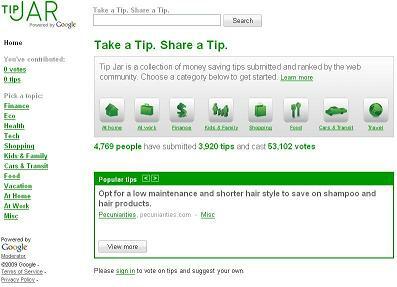 The TipJar home page claims that 4,769 people have submitted 3,920 tips and cast 53,102 votes. I will be curious to see if it catches on and where it will be in a few months. I love the idea of crowd-sourcing such a wide and yet personal topic, but the user interface seems to be a little bare bones and there are plenty of duplicate tips. Tags to improve navigation and comments for feedback would certainly help. Is Grocery Game worth the play?